Physical fitness affects pulse and blood pressure. Both are measurements of your cardiovascular health. A runner will typically have a lower pulse and blood pressure than someone who isn't as fit because a runner's body is able to work more efficiently, notes Lawrence Horwitz, a cardiologist and professor of medicine at the University of Colorado Health Sciences Center in Denver. The pulse, also known as the resting heart rate, refers to the number of times your heart beats per minute. The unit of measurement is BPMs, and the reading is a single number, such as 60 BPM. The heart beats 60 to 100 times per minute when most people are at rest, but the resting heart rate is usually lower in physically fit people. "The pulse in a runner is lower than in sedentary, out-of-shape people because a runner's heart doesn't have to work as hard to pump blood to where it's needed," Horwitz says. Generally, the lower the pulse, the more fit you are. While the average pulse for a non-runner is 60 to 100 BPM, a runner in peak condition could have a pulse as low as 40 BPM. 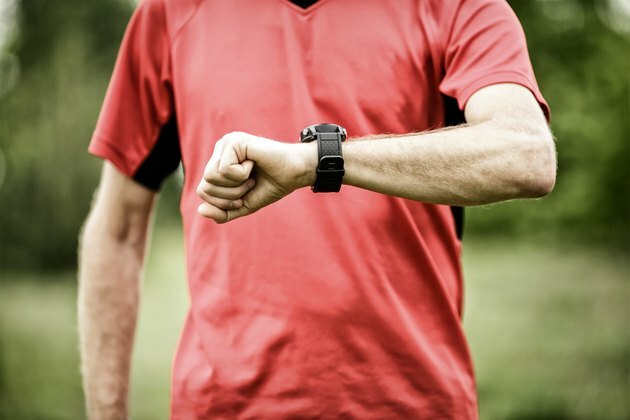 "Marathoners and professional runners sometimes have a resting heart rate in the low 40s, but the average pulse for a runner is probably between 45 and 55," Horwitz notes. The best time to take your pulse is in the morning, after a good night's sleep and before getting out of bed, according to the American Heart Association. "If you're feeling stressed, you're dehydrated, or your bladder is full, you may have a slightly higher pulse," Horwitz observes. Blood pressure is a measurement of the pressure of blood against the walls of your arteries. The unit of measurement is mm Hg, which means millimeters of mercury. Your blood pressure reading has two numbers, such as 120/80. The top number is the systolic pressure, or the pressure as the heart beats and forces blood into your arteries. The second number is the diastolic pressure, or the pressure as your heart relaxes between beats. Running lowers blood pressure for the same reason it lowers your resting heartbeat -- the heart doesn't have to pump as hard to get blood into your arteries. Normal blood pressure for a runner is around 110/75, compared to around 120/80 for a sedentary person, according to Horwitz. Anything over 140/90 is considered high blood pressure, also known as hypertension. Exercise is known to lower blood pressure. In fact, becoming more active can slash blood pressure by as much as 4 to 9 mm Hg, which is as much as some blood pressure medicines, reports the AHA. A marathoner or extremely fit runner might have blood pressure as low as 105/65, notes Horwitz. Blood pressure that is too low could cause dizziness or even nausea, but low blood pressure is much better than high blood pressure, which increases the risk of a heart attack. Lower blood pressure is associated with a longer life expectancy, the cardiologist observes. In addition to lowering your pulse and blood pressure, physical activity such as running raises your levels of good cholesterol. Running also helps to manage your stress level, decrease your risk of depression, ensure that you are getting enough vitamin D, and keep your weight within a health range, reports the AHA. All of these factors are good for your heart.